TRIVIA of Noh : Q40 : What is the difference of “noh-kan” (Noh flutes) from other flutes or pipes? | Home | Trivia | Q40 : What is the difference of “noh-kan” (Noh flutes) from other flutes or pipes? What is the difference of “noh-kan” (Noh flutes) from other flutes or pipes? 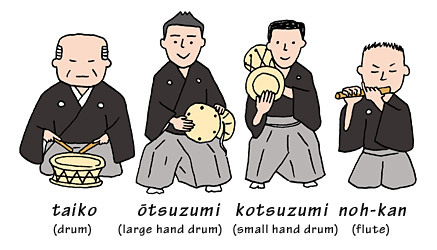 Noh music is played by several percussion instruments and cross flutes called “noh-kan.” Noh-kan is the only instrument that makes melodies for the stage. It sounds very different from European flutes or other Japanese ones. The difference is made by its unique structure. The length of the bamboo flute is generally about 40 cm, although there is no strict rule of the measurement. The lacquered exterior has a touch of beautiful craftwork, and the interior also has several layers of lacquer. It is believed that the manufacturing influences the acoustic quality of the flute. There are some variations for which bamboos are split vertically and reassembled to put the smooth hard surface inside. The biggest difference of no-kan from other flutes maybe the difficulty of execution. There is a small bamboo tube called “nodo” (throat) embedded inside near the mouthpiece. You cannot play higher notes unless you blow strongly. Each instrument has its own notes, which cannot be measured by the modern musical scale. How do they note the unique tones from no-kan? There is a kind of musical scores called “shōga”. The score shows us the sound of the tones in Japanese phonetic characters, something like “ohyai-hyowoi-hyaa-liuhi.” It is marvellous that the tune would sound like above, even if it is played by a different instrument with different sound. Together with the other percussions, the unique sound from noh-kan creates unusual strain in the Noh theatre. The highest tone called “hishigi” (crush) has a special acoustic effect that shakes our souls. It may symbolise the spiritual and mysterious aspects of Noh.